Anytime I make tiramisu, I end up with a bunch of leftover egg whites. That is when I like to break out my egg white recipes. People enjoy them because they are lower in fat content. I just like them because they are a convenient way to use up those leftover whites...and I hate to waste food! 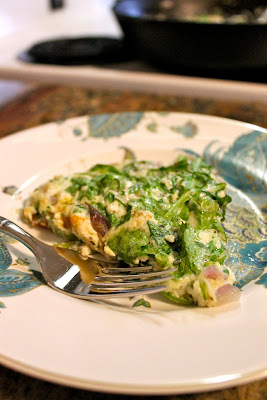 I love to make frittatas because they are easy and you can use whatever you have in your refrigerator or pantry. Feel free to mix up this recipe with whatever you fancy--mushrooms, tomatoes, or even potatoes go really well. The only important thing to know here is that you want to use a pan that goes from the stove top to the oven. I love my cast iron pans for this reason. If you are in the market for a new pan, I highly suggest going with a Lodge cast iron pan. You will be so happy you did, especially considering you now have the perfect frittata pan! Once you get yourself hooked on this easy breakfast, you will make it again and again. 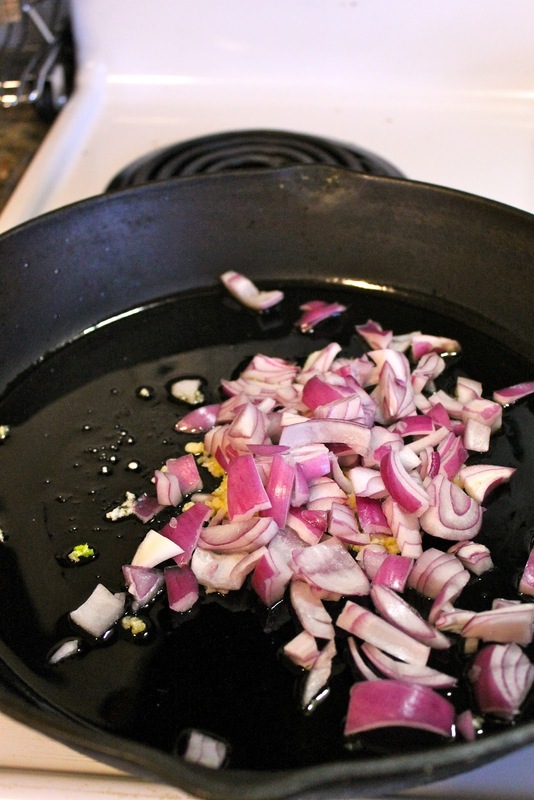 Start by throwing some olive oil, garlic and onions in your pan. When I am cooking with egg whites, I like to use red onions because they have a little more color which looks pretty at the end. Yep, I use them 'cause they are pretty. And can I say one more thing about these onions? Why do people call the "red" onions? They are clearly purple. But every time I say "purple" onions, people give me funny looks. Go figure. Dried basil. As a point of interest, I guess my measuring spoon had some static cling or something. See how it all stuck to it? Funny, no? Okay, now scramble it all up and stuff. Pour into your pan, and give it a stir to get it all evenly distributed. 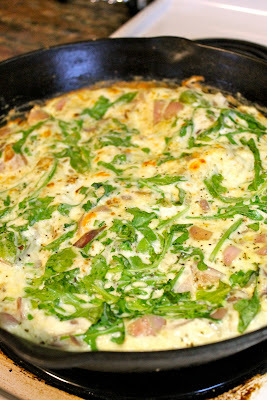 Top with arugula, distributing evenly on top and pressing down a bit into the egg. You are going to let this cook about 3 minutes more and then take the pan and put it in the oven on LO Broil for 2-4 minutes. Yes sir! Looking good! See how it has that golden look on top? That's how you know it's done. YUM! Cha-ching! I ate this for dinner. But it makes a perfectly suitable breakfast, of course. Not to mention fast! In a skillet, heat your olive oil over medium high heat. Add onion and garlic to the pan and cook for 3 minutes. Salt and pepper them. 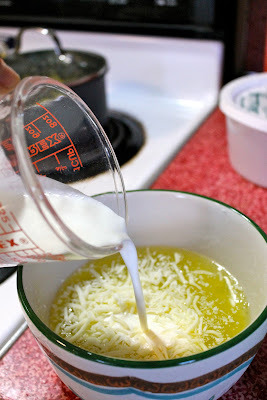 In a small bowl combine egg whites, cream, basil and cheese, using a fork to beat them. Pour the egg mixture into your hot pan and stir a bit to evenly distribute the onion evenly. Top with a handful of arugula, patting it down into the egg mixture and again, distributing evenly. Let it cook on the stove for 3 minutes. Pop the whole thing into the oven on LO Broil for 2-4 minutes or until the top begins to get golden brown. Remove from oven, slice and serve! YUM!